Are you using Windows XP version and creating backup data regularly? Has your Windows XP backup data stored in NTBackup BKF badly corrupted? Do you want to repair NTBackup on Windows XP on the spot? The problem of inaccessibility and damage to BKF files can happen anytime because corruption is an unpredictable situation which might pose data threatening situation. Whether you are using Windows XP or some other version, losing BKF file is a commonplace situation these days for which a solution is indeed required. 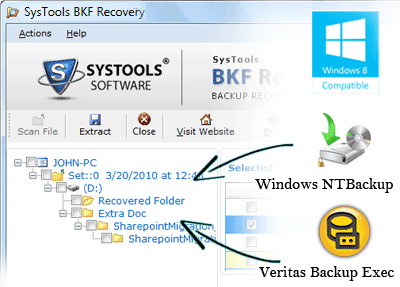 In order to repair NTBackup on Windows XP, you can use our BKF Recovery software. Scenario of losing BKF file: The organization where you work uses Windows in XP edition. You create bulk of important official data daily. This is the reason you take backup of content daily. This is a good and appreciable step from your side. However, do you have any idea that backup data can also get damaged? Corruption to Windows XP cause struggling situation in front of you especially when you lose original data and backup data at the same time. We, as software providers commit you to get you back your BKF files created using NTBackup.exe facility. Stop wondering how tool works and repair NTBackup on Windows XP because freeware demonstration edition of our software supports showing you all the features and functions. Free of cost trial run loads and scans damaged BKF files. With free trial copy, you can also repair complete data but can save healthy data at the desired location by buying full version. Range Base scan is apt for scanning and repairing only few amount of data user has desire for. Quick scan option scans and repairs bulk and complete BKF data. When you it is low levelled corruption, this option is well suited. Deep scan option scans and repairs complete BKF files but take two rounds in getting complete. For serious and major data loss situation this type of option is best to choose.